Representatives from countries with restrictive media laws showed support for the French publication. 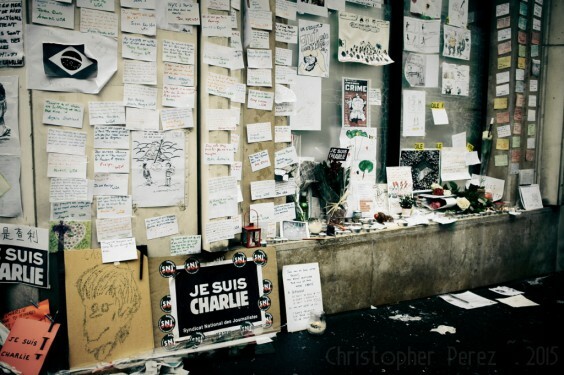 A memorial for victims of the January 7 attack at the Charlie Hebdo office. photo via Flickr user: Christopher Perez. On January 11, millions gathered in Paris to show solidarity for the satirical magazine Charlie Hebdo. On January 7, extremists entered the magazine’s office and killed five cartoonist-journalists, as well as two officers, a columnist, a copy editor, and three others. Five more were killed in other attacks over the next two days: a police officer and four shoppers at a Kosher supermarket. Sixty world leaders and dignitaries attended Sunday’s rally, leaping at the occasion to be seen as “staunch defenders” of the press, even while many of them are guilty of suppressing free speech themselves. This list was brought to our attention via Twitter user @DanielWickham93. According to Human Rights Watch, “Jordanian law criminalizes speech deemed critical of the king, government officials, institutions, Islam, and speech considered defamatory of others.” Last year the Jordanian government sentenced a Palestinian journalist to imprisonment with hard labor for criticizing King Abdullah. Turkey ranked 154th on the World Press Freedom Index of 2014. Journalists working in Turkey report in a growing climate of fear and intimidation. In December 2014, 23 journalists were detained in a nationwide operation targeting publications that criticized Turkish President Tayyip Erdoğan. Although Israeli journalists enjoy media protections, news outlets are subjected to military censorship and gag orders. Due to tensions between Israel and Palestine, journalists also face travel restrictions. The judiciary has imposed bans on topics that are deemed “sensitive,” including the quotation of foreign sources. In the past three years, nine Egyptian journalists have been killed, 50 injured, and 200 arrested in connection with their work. The freelance journalist Mahmoud Abou Zied has been detained for 500 days, and there have been frequent reports of torture used against imprisoned reporters. Despite constitutional guarantees banning censorship and imprisonment for media offenses, Egyptian government officials regularly find reasons to arrest and detain journalists. On a scale where a score of 100 is the worst, Freedom House ranks Russia’s press freedom at 81. Despite a constitution that provides for free speech and press, the country’s officials use a corrupt court system to harass its journalists. Authorities use laws that give extremism a wide definition to silence reporters, bloggers, and even ordinary citizens who criticize the government. In December, the UAE’s federal supreme court sentenced human rights activist Osama Al-Najjar to three years in prison and a fine for tweets that criticized prison conditions and mistreatment in detention. According to Reports Without Borders, he was also convicted of insulting the state via Twitter, inciting hatred and violence, spreading false information, and being a member of Al-Islah, a party affiliated with the Muslim Brotherhood. This is just one example of the measures UAE authorities take to persecute critics of the state. Amnesty International reports that a Tunisian military court recently sentenced blogger Yassine Ayari to three years imprisonment for charges that he had “defamed the army” in a series of Facebook posts, dating from August to September 2014. Yassine Ayari was arrested at the Tunis airport on the 24th of December as he was returning from France. He was informed that the court had tried and convicted him in absentia in November. Bahrain is the second biggest jailor of journalists in the world per capita. A 2002 Press Law allows five years’ imprisonment for publishing criticisms of Islam or the king, inciting actions that undermine state security, or advocating a change in government. Libel, slander, and “divulging secrets” are considered criminal offenses, and counterterrorism laws are commonly used to suppress opposition groups and freedom of expression. The United States has begun to place national security interests above the right to information. In 2014, the US plummeted 13 places in the World Press Freedom Index, down to 46th place. The conviction of Chelsea Manning, the manhunt for whistleblower Edward Snowden, and the Department of Justice seizing thousands of Associated Press phone calls were cited in the report. Other violators of press freedom attending the rally included: the Prime Ministers of Georgia, Bulgaria, Ireland (where a blasphemy law has been on the books since 1937), the United Kingdom, and Greece; and the Presidents of Mali and Palestine. One Comment on "10 Press Freedom Violators Who Attended the Charlie Hebdo Solidarity Rally in Paris"